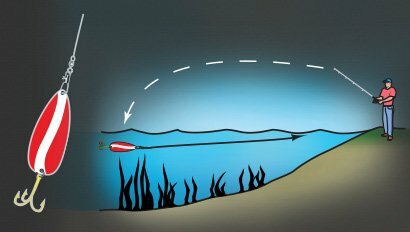 tips & tricks for Pike fishing. Northern Pike tend to lurk in and around weed beds. They are especially fond of the wide, leafy cabbage weeds found throughout Canada and the Northern U.S. In early spring when the ice thaws out, Northern Pike will seek shallow weedy bays (sometimes as shallow as two feet). As the spring progresses into summer, Northern Pike will move into deeper weeds. Northern Pike are sight feeders. The best times to fish for them is during the day. On sunny days especially, they viciously attack spoons and spinner baits reflecting off the sunlight. In the spring, retrieve your lures slower than in the Summer and Fall. Both lures and live bait are effective for Northern Pike. Spoons, spinnerbaits, diving plugs and larger rigged swirltail grubs are all effective. Spoons are very effective when casted or trolled. When casting spoons and spinner baits, try a steady retrieve or a “stop and go” style to imitate a struggling baitfish. Retrieve at a speed that allows the bait to run just over the weed tops or parallel to the weed edges. Here are some popular approaches to Northern Pike fishing. Extreme care must be taken when landing Northern Pike. Use long pliers and avoid placing fingers in the mouth or gills. Do not land Northern Pike by placing fingers in the eye sockets as this will harm the fish. Care must be taken not to remove protective “slime” from their body as this exposes fish to harmful bacteria. Tie steel leader onto line. Attach spoon to steel leader. Retrieve at speed where spoon is swimming barely over the weed tops.